The verb in French for savour is the regular ER verb savourer. Many English verbs can be 'made French' by adding -ER! This is one. To remember this imagine that a Frenchman SAVOURING his soup which is in the French colours.. Such an image, viewed vividly in your mind will make it easier to remember and recall the word. Incorporating the 'French colours' in his soup will remind you that the word is similar in French as it is to English. Make the image as strong, colourful, silly, and full of action as you possibly can. The more of each feature the greater will be your ability to remember the word. Adding in a cartoon Memory Trigger makes it even easier still to remember. Make this visualising a habit and you will start to do it subconsciously. You probably already make such 'associations' without thinking about it. Harness this skill and make it a discipline, and you will remember a great deal more. savour! savoure ! savourons ! savourez ! ⇒savourer is a regular ER verb conjugated using the same pattern of endings as five thousand regular ER verbs. ⇒Learn savourer and it will reinforce the pattern for ALL those other ER verbs. 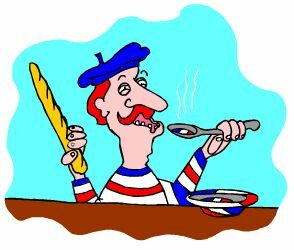 ⇒ They feature French verbs like the French for savour - savourer. ⇒ You can more easily remember words like the French verb savourer - French for savour - using the techniques of the world's Memory Masters.